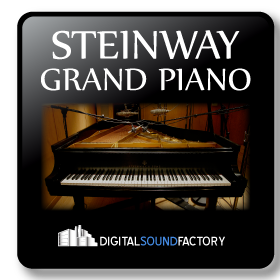 Digital Sound Factory included Steinway Grand in our April 2016 goody bag. This beautiful Steinway Model L Grand piano was recorded at Whip Records in Berkeley, California. Using Neumann U67 microphones and high quality preamps, multiple layers were recorded at 24-bit resolution. Each sample was reviewed, and the best were assembled to create the Platinum Grand. As a result of this process, the samples are perfectly matched, sound great, and are free of artefacts. This natural sounding piano will work in any track mix.